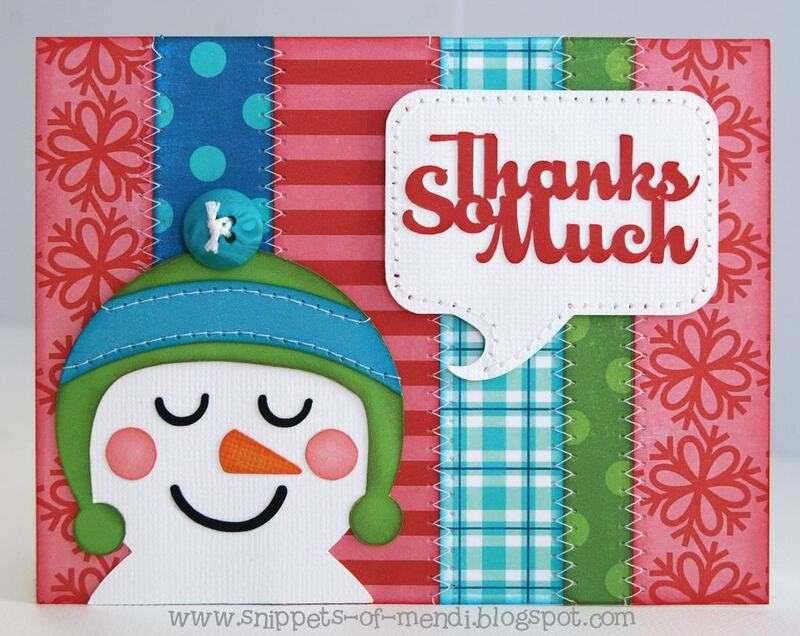 Today I am sharing some cards over at Lori's blog using some more of her wonderful digital frosty papers. I had some extra paper scraps I had leftover from last week's layout (seen here) so I was able to make a couple cute post holiday thank you cards. Working with some of the same shapes I was able to give the snowman cutting file a new twist by enlarging him and using just his head and shoulders. I love how he looks paired with Lori's thought bubble and cute thank you phrase. The cherry on top is that I was able to create something useful with small scraps that would otherwise be lining my waste paper basket. So fun!!! Love the colors on this super cute card. Wow...I really haven't been over here to your blog in a long time...you've been super busy!!! I am SOOOO loving this bright fun card (love the blues in there!!)! That snowman is adorable!! !